This book synthesises 30 years of research and development on hall acoustics, and work in collaboration with R. Lamoral and L. Cremer. The first part, while describing the objective and subjective criteria which make it possible to qualify and quantify the acoustic performances of halls, also aims to be pragmatic using a number of concrete case studies. It specifically goes through the history of halls over the centuries and throughout the world, to explain to the reader the current state of the art in the acoustics of opera houses and concert halls and the genesis of this knowledge. The second part of the work is devoted to the large opera houses and concert halls that Alain Tisseyre has studied; he goes on to present his method and the results. He attempts to answer two questions: why does the Berliner Philharmonie remain to this day a reference for concert halls, and why have other new and innovative concert hall shapes not been developed? He comes up with the following answer: the success of the acoustics in this hall, famous worldwide, is because a balance has been reached in the control of temporal scheduling (arrivals) of early and late reflections. This leads to high acoustic envelopment (LEV) in every seat. The breakthrough happened when L Cremer applied research & development work, carried out in mid-twentieth century, to the Berliner Philharmonie. Today, thanks to the visualization of temporal scheduling and the direction of the wave train energy received in the listener’s ears, modelled by the Hall Acoustics computer model, based on finite elements, and developed by A.Tisseyre, we can accurately forecast the acoustic performances of any volume, whatever the shape and material. The Apollon hall in Nice, designed by L. Cremer and R. Lamoral, was the first hall designed with the help of the HallAcoustics computer modelling: its acoustic quality is as good as the Berliner Philharmonie. 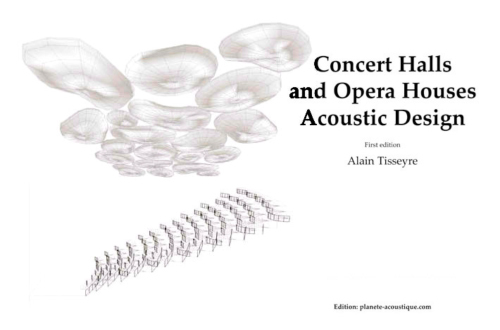 In his book, Concert Halls and Opera Houses, Acoustic Design, Alain Tisseyre demonstrates that both acoustic and architectural design processes of a hall are completely interdependent and form a whole. Therefore, the essential concert hall shape will only evolve when the owners of these buildings start to really take notice of these new procedures rather than just copy the shapes of existing halls without a real understanding of the essential acoustic phenomena, LEV and ASW. In the meantime, concert halls built in the same shape as the Berliner Philharmonie have a bright future. It should be made clear that simply copying the shape does not guarantee success nor represent a response to the development of future concert halls which will need to meet the requirements of tomorrow’s (new) events. Today, China is the country where most opera houses and concert halls are being built. Alain Tisseyre sets out in his book the many halls he has studied and which are being built there, to illustrate the process of acoustic design related to the architecture of the halls.